Your sports club could offer the best product possible in your niche and the best service on the top of that, but without a website, you can’t effectively prove its value. In case you don’t have a web presence yet, don’t fret. 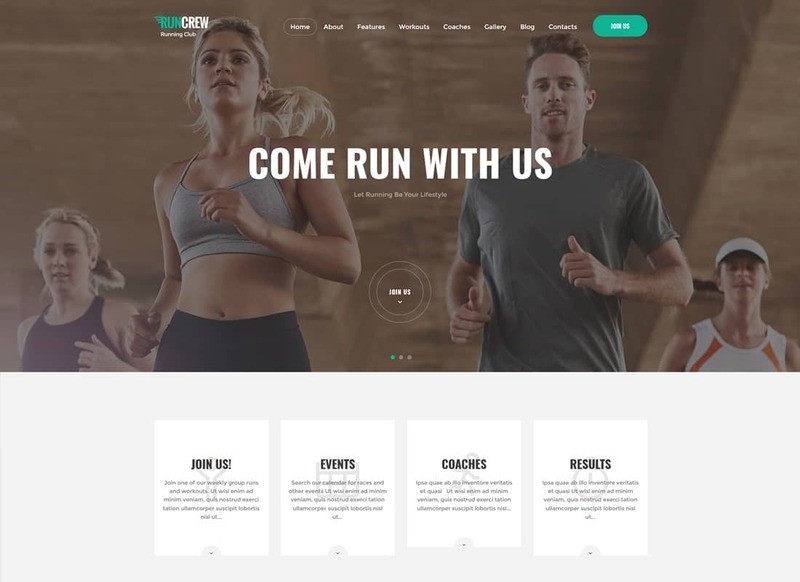 The list of the most powerful sports and fitness WordPress themes should be high on your list when you plan to build a website. To draw people to your fitness center, tennis club or wellness salon, it’s important that you make a good first impression. With millions of sports clubs out there, yours should stand out among even the toughest competition. This is hardly a secret that thousands of high-quality WordPress themes make it easy for you to build a website. Moreover, you can completely change any site’s design at the touch of a button. Coding issues? That is not a concern for you. The beauty of premium solutions is that they can minify as much coding issues as possible. Besides, most of them are responsive, SEO optimized and can help keep your website up to date. So, no matter what sports niche you choose to pitch yourself in, the list of sports and fitness WordPress themes is the solution. Remember, your website is more than just ads with pictures of super fit people, it’s about communicating the right message to the target audience. Now, go make your choice. As you see, that diversity of sports and fitness WordPress themes abounds for sure. Yet, one thing is certain, without a website you can’t compete effectively in this evolving sports industry market. So, make your choice today to get started with your sports website that can cut through the noise. It would be in your own interest to not miss out on valuable leads and sales opportunities. The truth is that once your website is up and running, you can expect a boost in your business. That would be a huge, right? 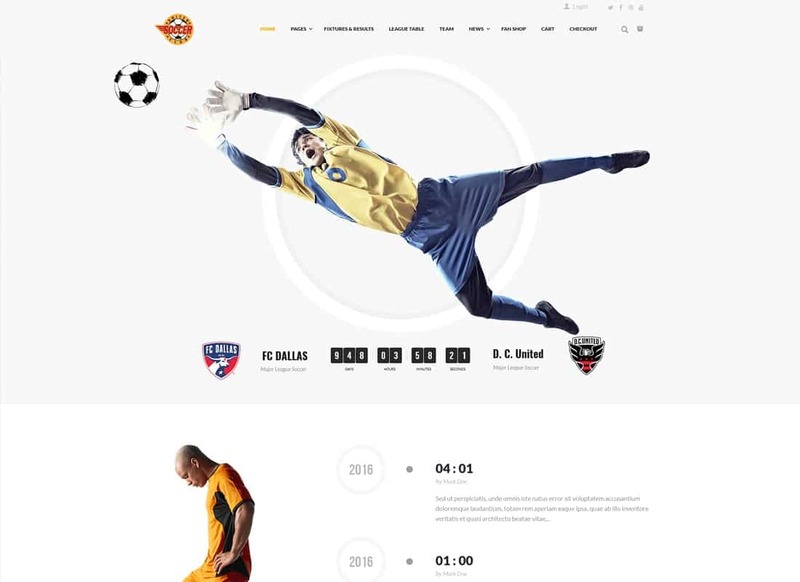 Build a fully personalized web presentation for your football club website by means of this flexible and dynamic WordPress theme. It allows you to manage literally all elements of its pre-designed layout according to your personal expectations. There are light and dark-colored layout options and a range of pre-made theme layouts. Using Elementor page builder, you can personalize the theme's pages in the drag-and-drop mode. You can also create a custom header and footer styles by means of the intuitive builder. The theme is created to keep the sports community engaged and entertained by means of full match reports and stats, individual player profiles, automated league tables, etc. 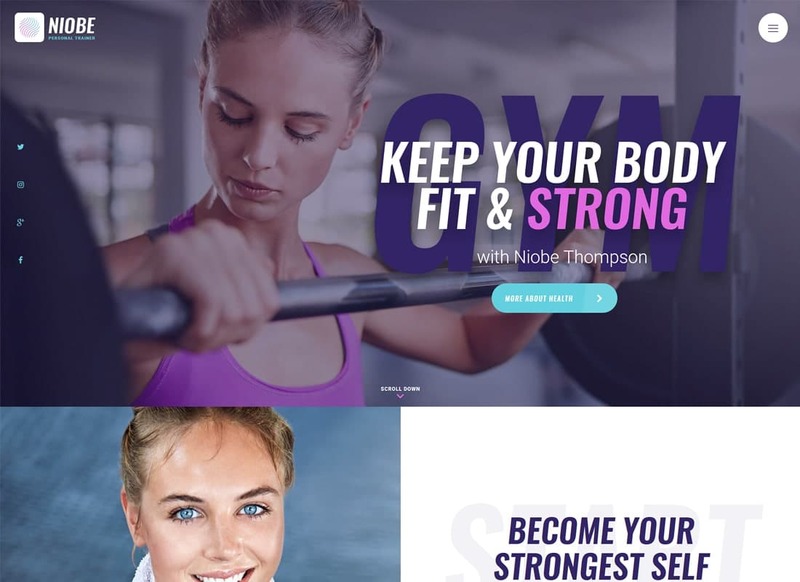 If you want to promote your gym or fitness brand, head on to Niobe. 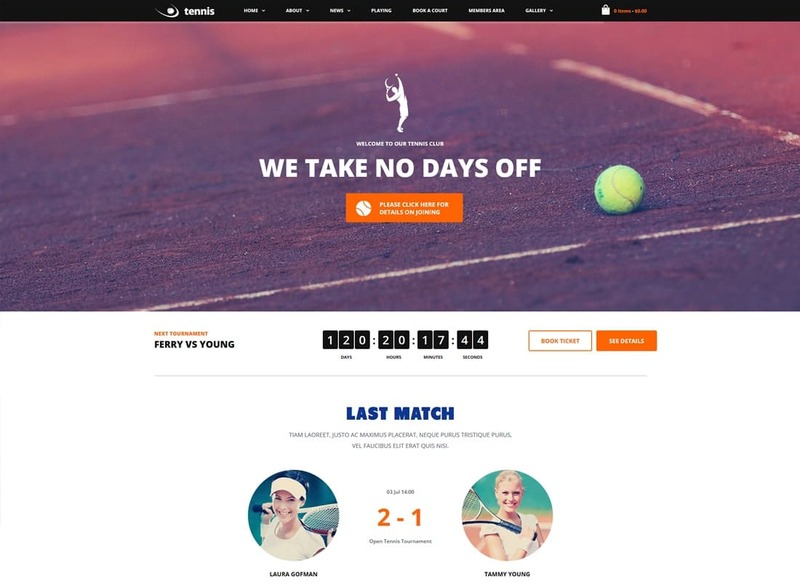 Modern, attractive and responsive, Niobe fits all kinds of sports websites. No matter what niche you want to pitch yourself, make sure Niobe will help you to be a cut from the rest. So, it comes with events management & calendar, weight/height calculator, and advanced contact & booking forms. Use your social media as a starting point to collect email addresses and contact details. Besides, with the help of dozens of pre-made shortcodes creating original content that builds up your brand is much easier. Using a simple color palette, Corredo stands out from the crowd. 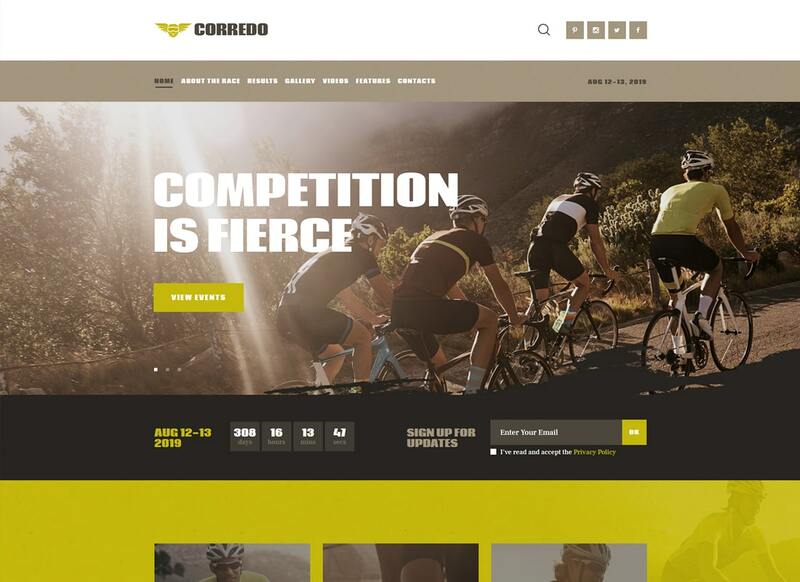 Designed for all kinds of sports events for moto & bike athletes, Corredo offers you an easy way to get started. Built on Elementor page builder, it can help you minify as much coding issues as possible. Notify your users about the upcoming sports events, create 6 or 8 weeks program, start a fan page. Go, invest some time in creating impactful content on your own website to reach out to your audience. Apart from that, Corredo is compatible with MailChimp, Essential Grid and Contact Form 7. At last, the more creative and professional is your website, the more likely people are to show interest. Promoting a gym, personal training business, sports club or team is far from easy. Yet, with the right specimen of sports and fitness WordPress themes things start to become easier. Run Gran is a modern, easy-to-use and elegant WP template designed to match the needs of eCommerce web projects. Apart from that, it fits a sportsman blog, healthy lifestyle coach or sportswear magazine. Thus, built with WPBakery page builder, it allows you to get creative with unique layouts till you're proud. Don't miss out on valuable sales opportunities with Run Gran. Promote your gym to your ideal audience where they spend most of their time. 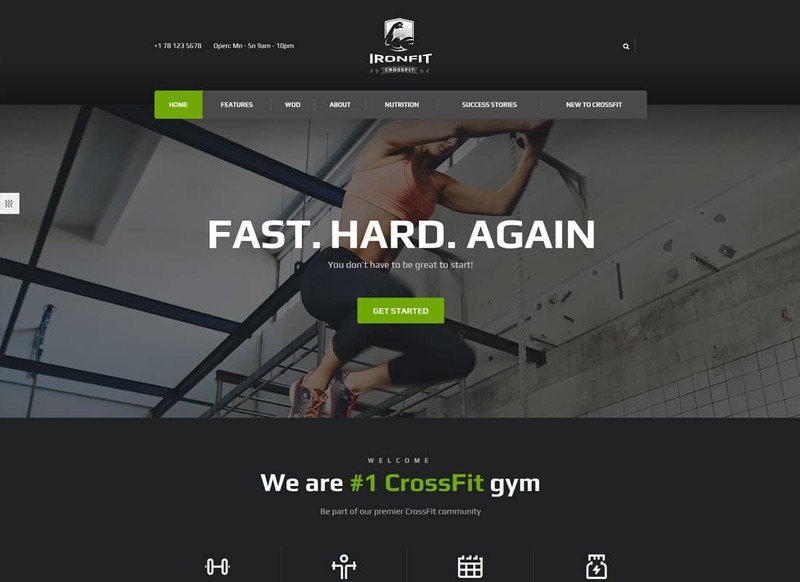 Ironfit is a stylish WP template that sticks out a mile from the other sports and fitness WordPress themes in the list. It’s clean and attractive layout is ideal for fitness, gym & CrossFit industry. Apart from booking management, it offers online programs, lessons & WOD, as well as schedule tables. Knowing that the best advert for any business is a happy customer it’s in your own interest to reward your loyal customers and encourage them to spread the word. I bet you’ll love Ironfit for everything that it offers you. Every business is different. What makes your brand special? Take a look at BeYoga. Compatible with WordPress 5.0, it can help you control the appearance of your website with less legwork from your end. So, designed for yoga classes, it fits gyms, health clubs, spa & wellness centers, CrossFit workouts. Indeed, WooCommerce integration allows you to promote and sell your sports products or services hassle-free. 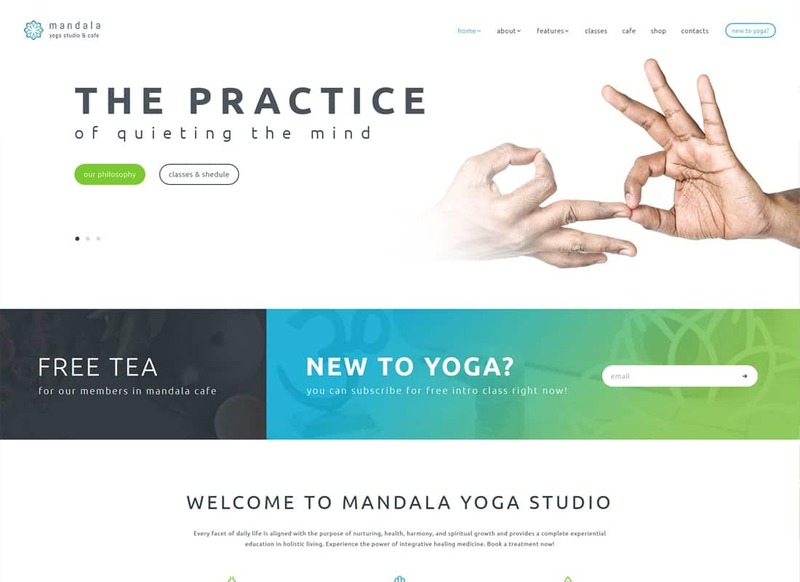 The beauty of BeYoga is that even a newbie can easily create new unique layouts and display the benefits of the brand efficiently. Give it a check right away. Looking for something special? Don’t miss out on the opportunity to open your sports brand up to a new market. 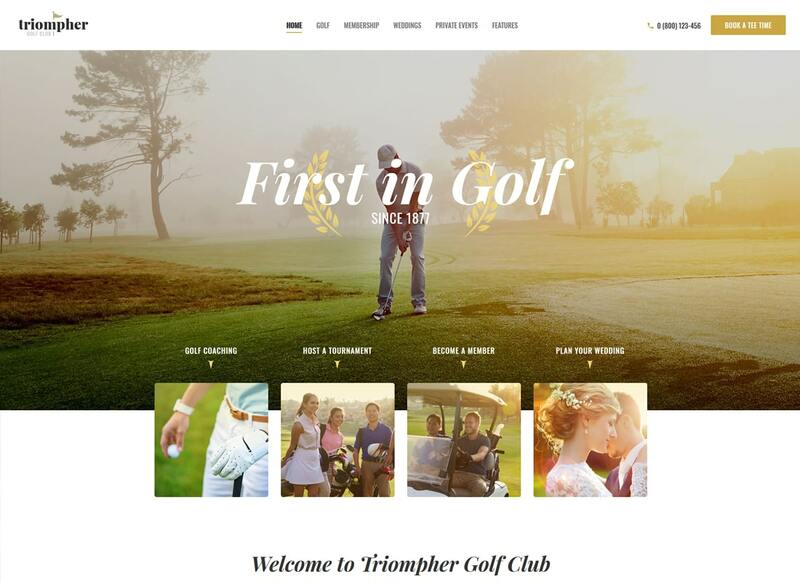 Stylish, trendy and clean, Triompher is a pot of gold for golf club websites. Moreover, it’s ideal for golf membership, competition, golf coaching, tournament and tee time reservation. To help you achieve your goal, it offers you to take complete control over your website appearance. Forget about coding issues, WPBakery page builder can help leave all the technical complications behind. Apart from that, it comes with events management, online booking tee time, and a set of advanced contact forms. Don’t shy away from starting an online store as it can meat a dramatic boost in sales. 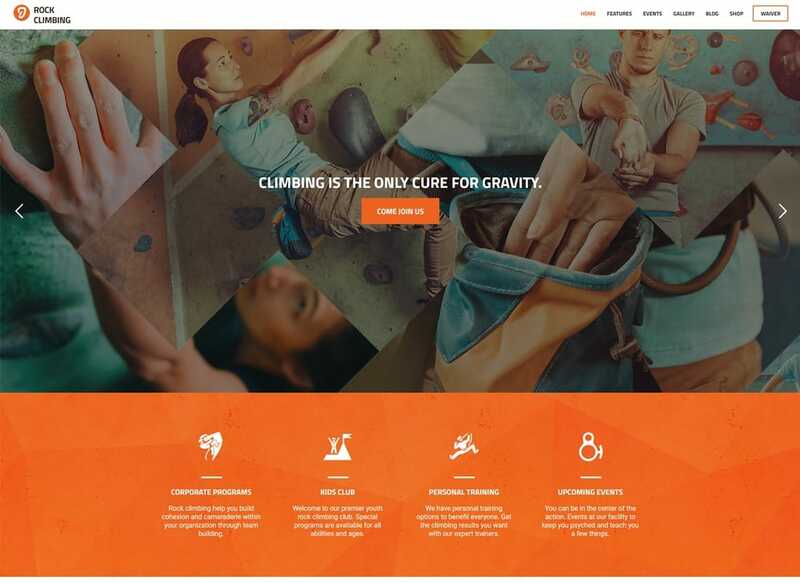 Mounthood is one of the top sports and fitness WordPress themes on the list. Why? Responsive, attractive and modern, it allows you to create a booming online presence with less coding issues. 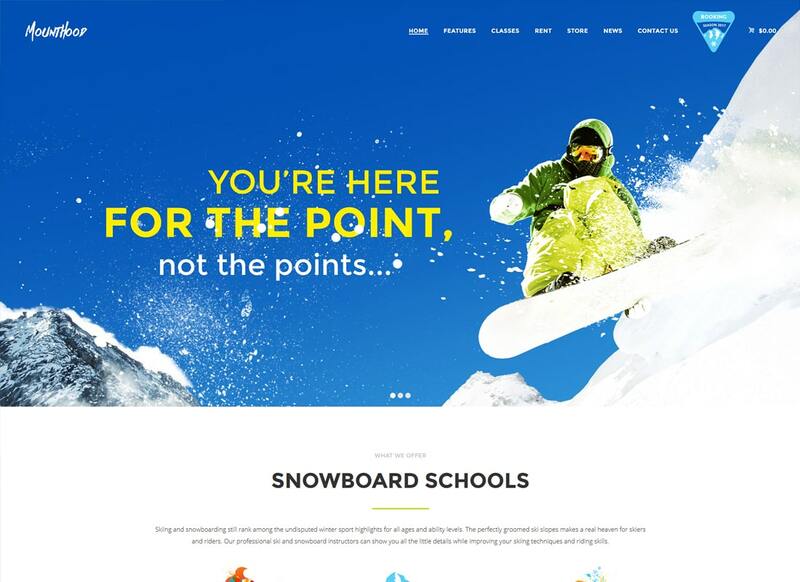 Designed for ski & snowboarding industry, Mounthood fits all kinds of winter sports web projects. Indeed, it comes with a set of pre-made pages to help you save a ton of time right at the start. Of course, nothing can stop you from creating new unique layouts with WPBakery page builder. Even if you're just starting out, no worries, though, coding issues are not a concern for you. So, what do you want to do next? Even if your team doesn’t play in the top league, that doesn’t mean you don’t deserve recognition. The good news, however, is that GYM offers you a quick way to promote your sports team for less. Responsive, bold & stylish, GYM fits all contemporary gym, sports club, and fitness center websites. What’s more, GDPR and Gutenberg ready, GYM is worth your precious time. Also, built with WPBakery page builder, it can help automate many tedious tasks on layout building. In case you need to enhance your selling spree, WooCommerce integration can help you out. Finally, its responsive layout looks awesomely across all screen sizes of modern devices. 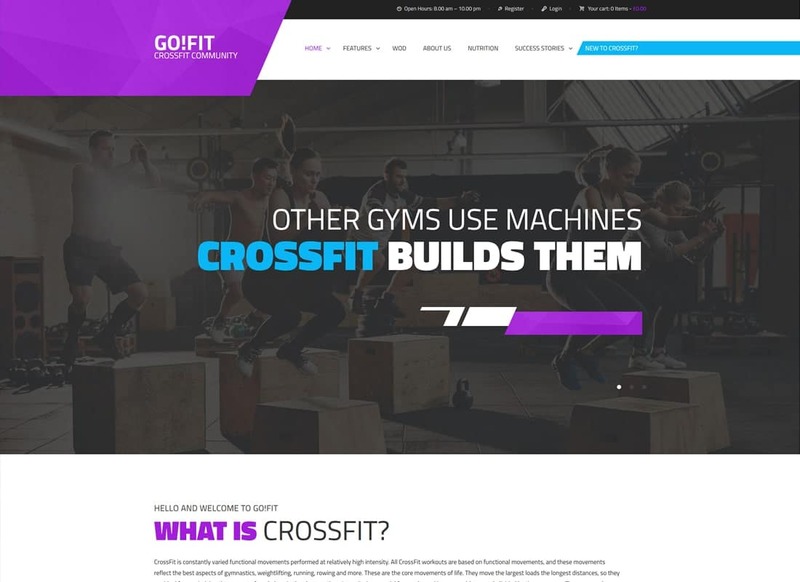 Here’s another great specimen of sports and fitness WordPress themes worth the attention. It comes with WooCommerce integration to make the selling online hassle-free. Snow Mountain is a perfect solution for all kinds of winter activity and ski resort apartment rental websites. Being SEO-friendly, it can drastically increase the likelihood that a prospect will find you. Do everything in your power to create a website that solves their problems. Indeed, you can create new layouts to make sure that your website appeals to your users. All in all, it’s never to early to promote your business online. Now, it’s time to get inspired. 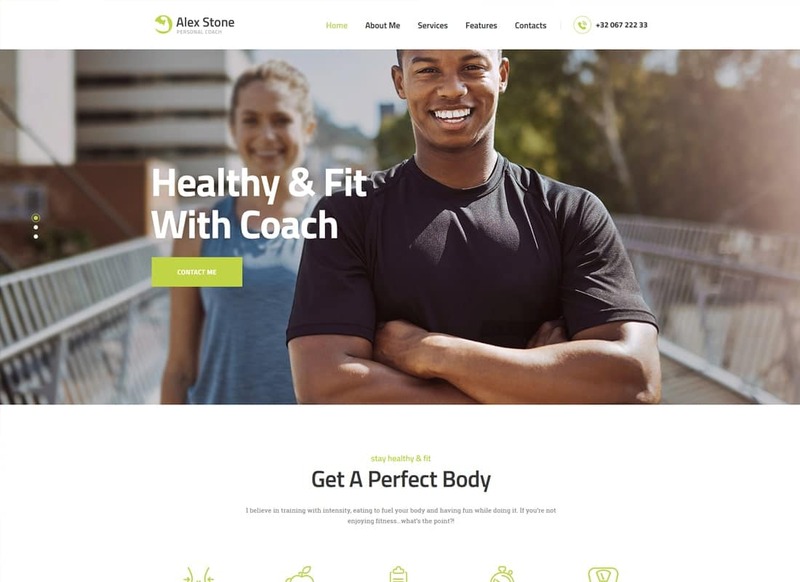 One of the most highly impactful ways to showcase you are an expert and an authority in the fitness industry is through your modern website. Give Steven Watkins a shot. Modern, attractive and responsive, it fits all kinds of sports websites. Whether you need to promote your nutritionist blog, sports magazine or gym, Steven Watkins has you a lot to offer. That's no wonder, it's one of the best sports and fitness WordPress themes out there. Once you go for it, your users will never feel overwhelmed at any time during their user experience on your site. Indeed, it's WooCommerce integrated, so start selling your products or services in a matter of minutes. Whether you're a yoga teacher competing in a crowded urban market, or a jogging trainer seeking a targeted audience, carve out your niche. 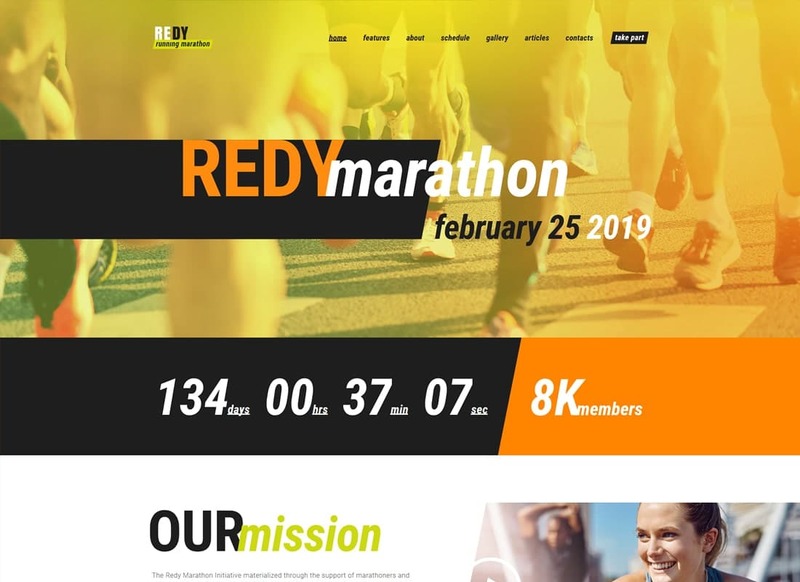 Hone your efforts to build a modern website with one of the best sports and fitness WordPress themes in the list. Redy can be your priority if you want to minify as much coding issues as possible. Thus, built with Elementor page builder, it allows you to get creative with new unique layouts with less coding issues. In times where everyone has a smartphone, a responsive website is a must. So, keep your content to eye-catching photos, brief videos, and short, witty captions that look amazingly even on small screens. Check its live demo to learn more. Attract more motivated visitors using a strong presence that sparks attention. Control the appearance of your website with one of the most versatile sports and fitness WordPress themes out there. Alex Stone is second to none when it comes to setting up a professional website with less coding issues. Also, tons of eCommerce options can help you boost your income over time. This can have a drastic impact on your sales, especially if you let people register for your classes right on your website. Want to cut through the noise efficiently? Use your website to build an email marketing list - give away content for free and get an email address in return. Smart and easy, right? Planning to start selling sports clothing or equipment? Do it right with GYM. 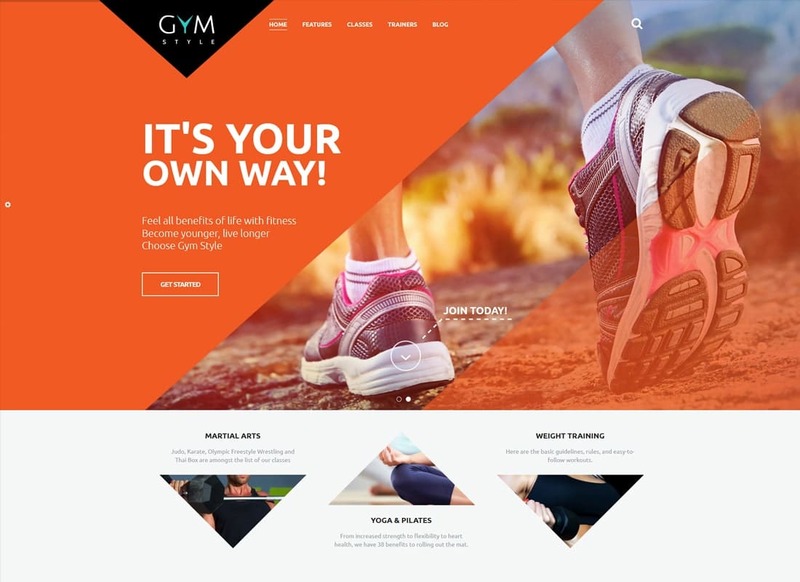 Designed to match the needs of eCommerce projects, GYM can make your site-building journey smoother & enjoyable. To help you out, it comes with 4 beautiful homepage layouts so you can save a ton of time right off. Indeed, it offers to streamline your work by using dozens of pre-made pages designed in an easy on the eye style. NEed to create more unique layouts? No problem, WPBakery page builder gives you an oodles of out-of-the-box solutions. Give your website an outstanding look to attract every user's eye across all modern devices. Take a look for yourself and you'll see that it's not all that difficult. Are you an established professional who is looking to grow your business? A professional website is a must to make your dreams a reality. Selling personal training services is much different today than it was a decade ago. Give Tiger Claw a try. Designed for all kinds of sports websites, it fits sportsman, trainers, coaches and all healthy lifestyle people. The beauty of Tiger Claw is its WooCommerce integration allowing to boost your income over time. Sure, by adding attractive galleries that showcase your team, your services and projects it’s easier to catch the attention. Don’t miss out on a huge growth potential with one of the best sports and fitness WordPress themes in the list. Adrena is a modern WP template that can give you a boost of creativity to get started. 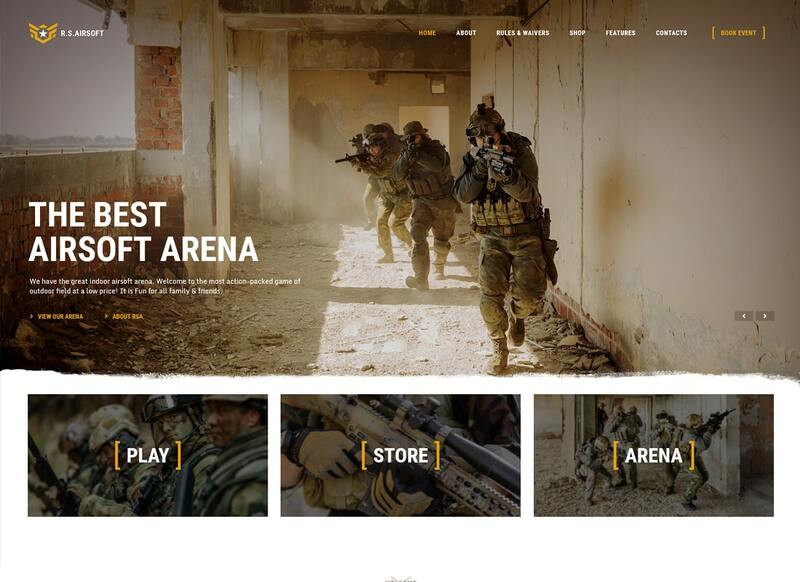 Of course, clean, responsive and attractive, it fits paintball club websites right off the bat. In fact, no matter what niche you want to pitch yourself in, Adrena puts the power into your hands from day one. So, get creative with it even without to get to learn how to code. Everything you need is right at your fingertips so waste less time just because delays kill. What makes Adrena even cooler is its WooCommerce integration that eases the process of selling online. Go, learn all the benefits of Adrena right away. You’ll be surprised by everything it offers you. 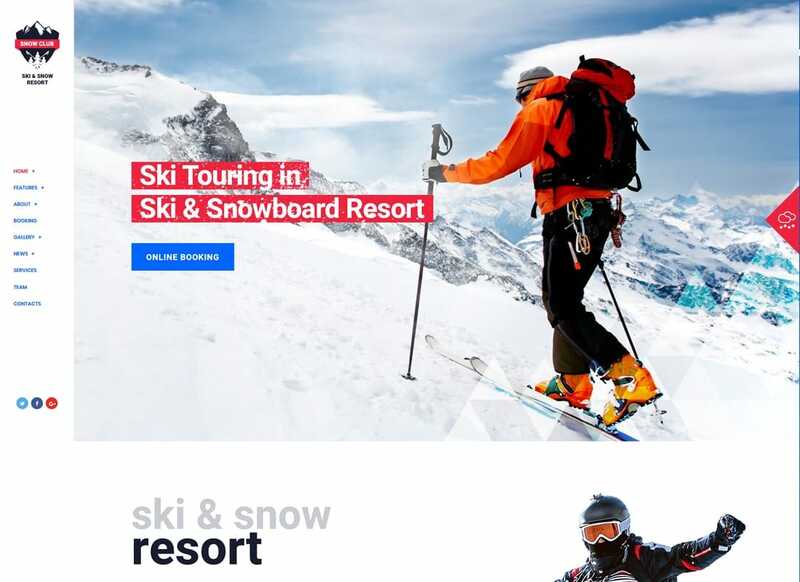 GDPR and Gutenberg ready, Snow Club fits all kind of ski & snowboarding resort websites right off. It doesn't matter what niche you are in, the ultimate goal is always the same - to get more people to visit your website. 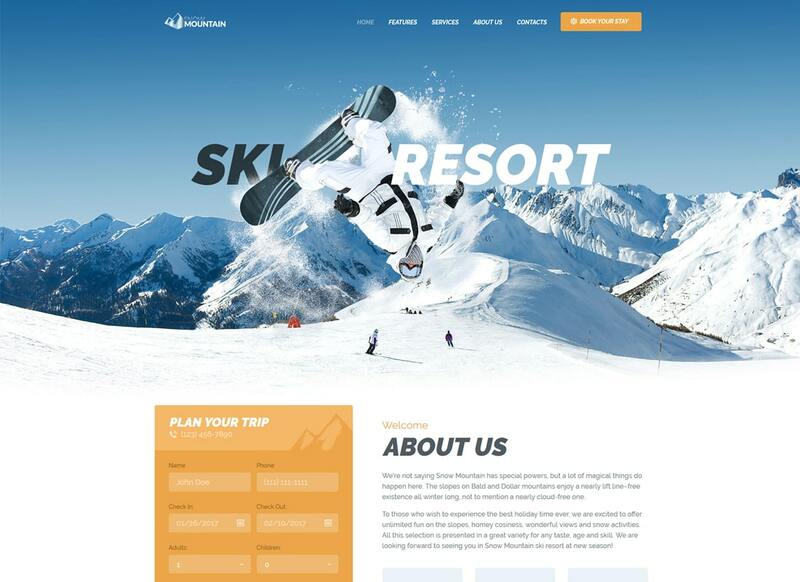 Responsive from the ground up, Snow Club can help engage your visitors once they land on your website. 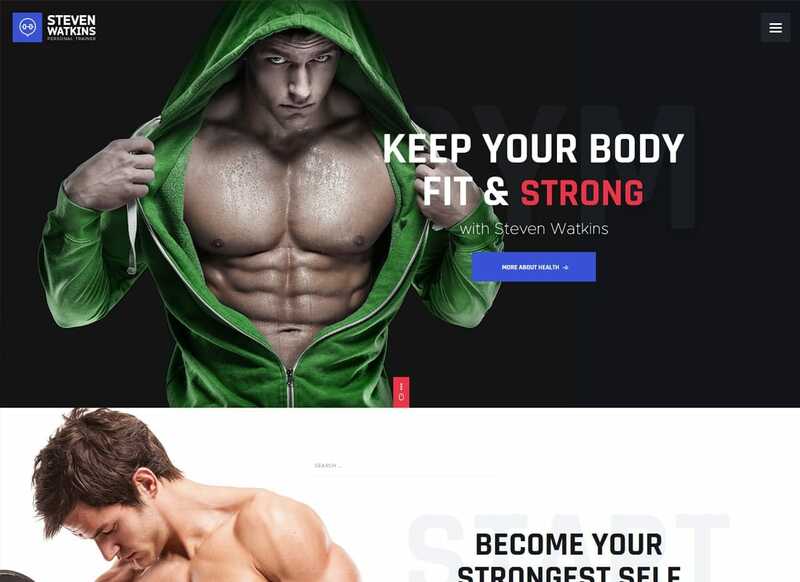 Considering that this specimen of sports and fitness WordPress themes is versatile, there's nothing to stop you from getting creative with it. Give visitors more than just what they get in the ski resort, go beyond their expectations. So, would you like to take advantage of Snow Club right away? 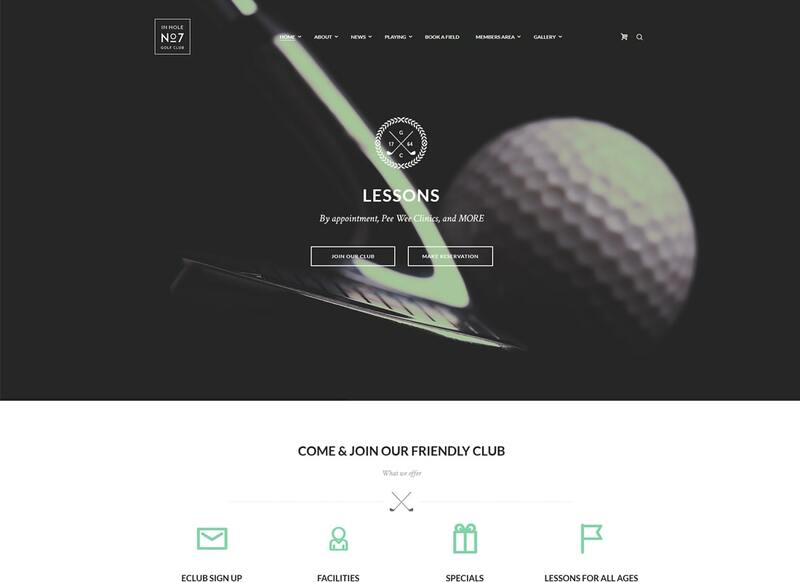 More often than not, your website is the first interaction your future members will have with your sports club. Take a look at the Tennis Club. Modern, colorful and alluring, it stands out from the rest sports and fitness WordPress themes out there. 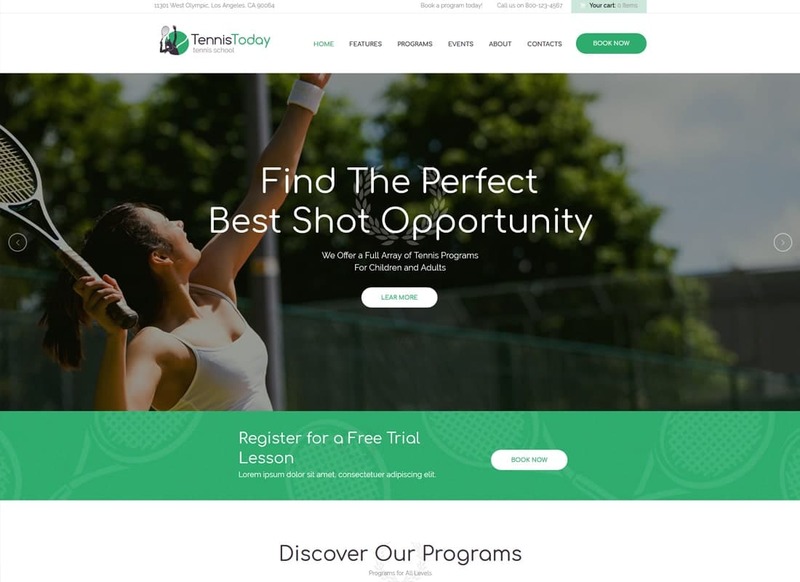 Designed to match the needs of tennis club websites, it fits all other kinds of sports web projects. Thus, you can get creative with it, add new layouts, make changes and edit it on a go. No extra coding skills are needed. Make sure that your services, pricing, and results are clearly depicted and easy to find on your website. Try to encourage your visitors to stop into your sports club. Need to create a website for badminton, bowling, boxing or cycling? Fear not to give Tennis Today a try. This stylish and modern WP template can give a leg up on the competition you need to cut through the noise. Responsive, modern and SEO optimized, it allows you to skip a lot of the time-consuming work right off. What you need is to add beautiful visuals to display the benefits of your sports brand effectively. Without a doubt, you'll be surprised that the site-building process is not that all difficult. Add an online store functionality and see how successful you can become with it. You're going to love it. Are you keeping up with the times? Does your website look consistent the same no matter what type of device the user is on? With Extreme, you can keep peace in mind, your website is responsive from the ground up. Moreover, it is more likely to appear further up the search results and help build trust with clients. Once you understand that a skill gap shouldn’t be a barrier to building a website, things will start to make sense. So, do you want your visitors to shop through your new collection of products? Sure, you do, so tell them so. Add an online store functionality to your site and start making profits even if you haven’t sold a thing before. There’s no doubt, a website built with Extreme will be beneficial for your business. Present your sports brand in a more summerish way. Build a website that adjusts correctly across all modern devices and attracts visitors from the first sight. 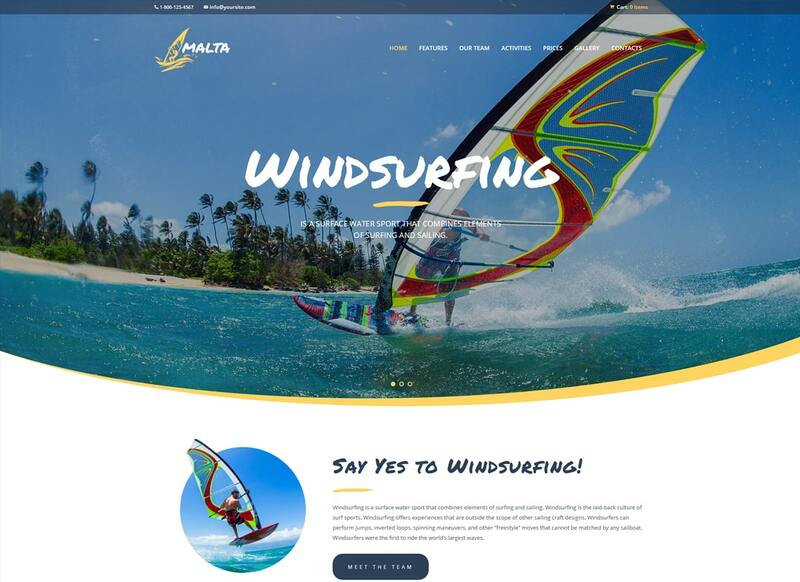 Malta is one of the best sports and fitness WordPress themes worth your attention. First, it comes with 4 awesome homepage layouts to help you get started even quicker. Second, it offers you a set of pre-designed pages so you can add as much information about yourself as possible. Next, give your users the ability to buy your products or services online and they’ll vote for you with their money. Go, get inspired by other key features that can help make your life easier right from the start. GDPR and Gutenberg ready, GoFit! will keep your website bang up to date. It's an ideal solution for all kinds of sports web projects, triathlon competition, and healthy lifestyle blogs. Thus, you can not only promote your services but also sell them directly from your site. 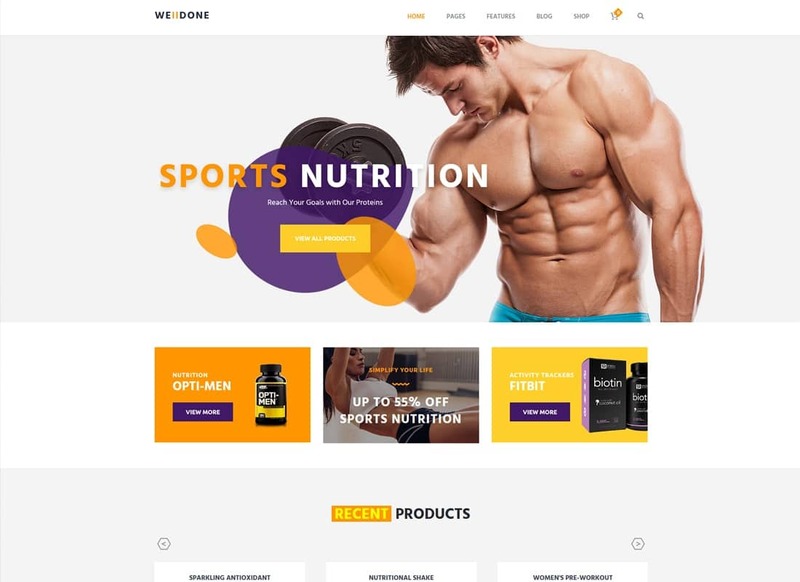 Add sports nutrition and equipment to launch a fully-functional online store that can be customized to your business branding. Also, it comes with schedule management, events, team & news management, 3 unique homepage designs, and multi-language support. Indeed, these are only a few of the key features jam-packed in GoFit!. The more inside. To get ahead of the competition, your website should spark attention right off. It's easier to achieve if you build your website with Yoga Shop. Designed to match the needs of modern yoga websites, it fits all kinds of sports web projects. Say, no matter what type of sports niche you are in, Yoga Shop comes to your aid. So, you get 4 outstanding homepage layouts to present your sports brand in a more appealing manner. 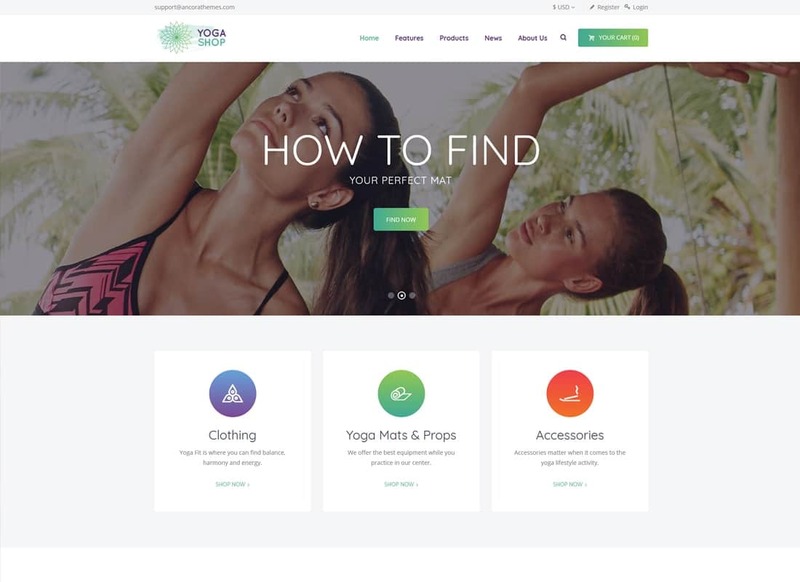 Apart from that, Yoga Shop is WooCommerce ready and comes with 2 shop styles to demonstrate your products in a clever way. Indeed, use advanced Events management to your full advantage. Anyway, getting people to stay with you longer is much easier if you go for Yoga Shop. 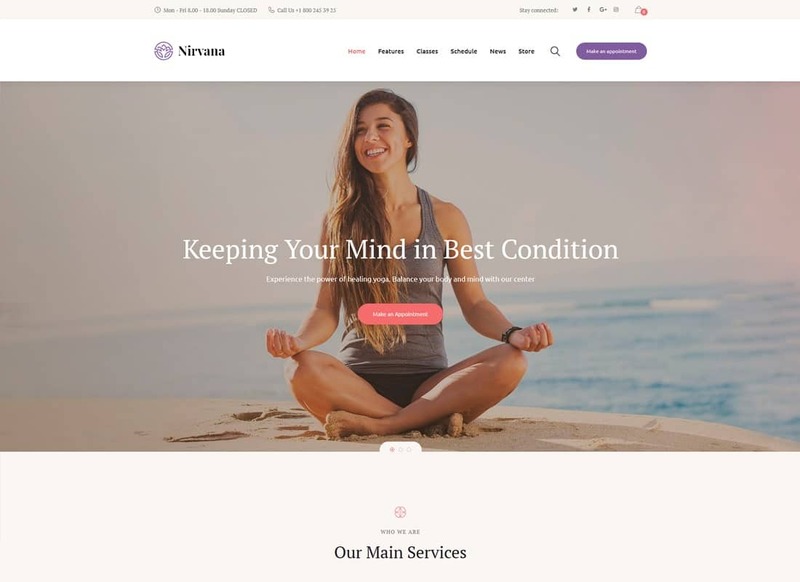 Nirvana is a modern specimen of sports and fitness WordPress themes that sticks out a mile. It fits yoga school, retreat center, wellness & spa salon, and even beauty shop websites. Show how your visitors can fulfill their dreams and reach their goals and how you can help them do that. Thus, you get 3 beautiful homepage designs to present your brand in a more eye-catching manner. Apart from that, you can easily create new unique layouts to jump ahead of the crowd. Your modern online shop is a click away from your users so make your money keep coming in. Face it, it' sure is nice when a modern solution can help you save a bundle. A skill gap shouldn't be something that makes your brain hurt when building a website. Quite the contrary. This should be an exciting adventure that leaves all the complications behind. Give Mandala a check. 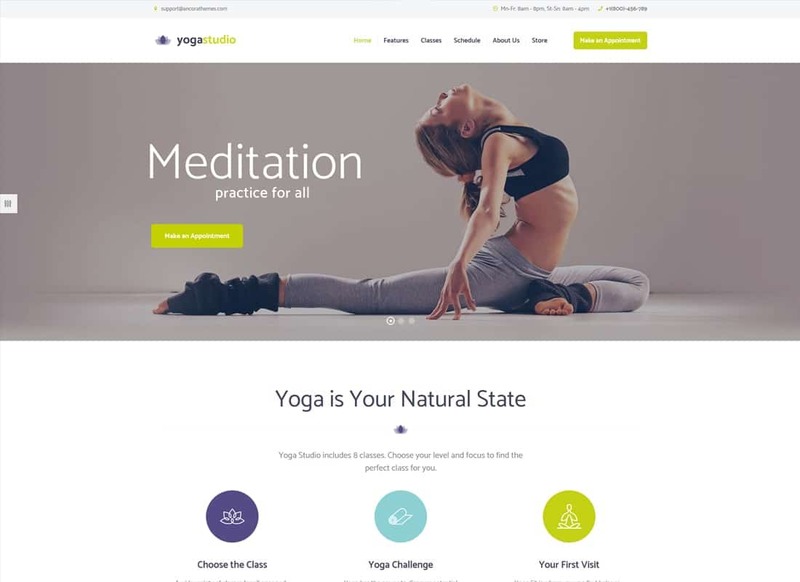 Designed for yoga websites, it is a great solution for yoga school, group yoga, dance studio, and health care. As a serious business owner, you know how an online store availability affects the user experience. Mandala as it's WooCommerce ready, so it can be a huge boost to your business. 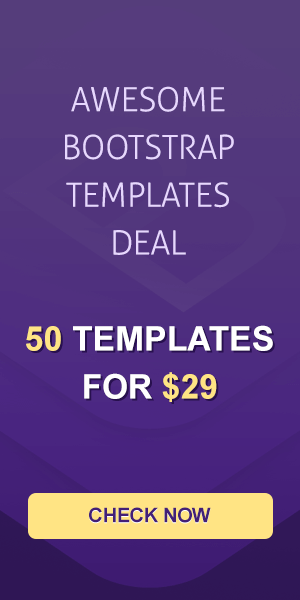 No matter what type of products or services you are going to sell, tons of pre-made modules, custom shortcode & widgets will numb your site-building pain. Now, go and get inspired by Mandala right away. Your sports club could be missing a huge opportunity for marketing if you fail to advertise your benefits that make your club more desirable than others. 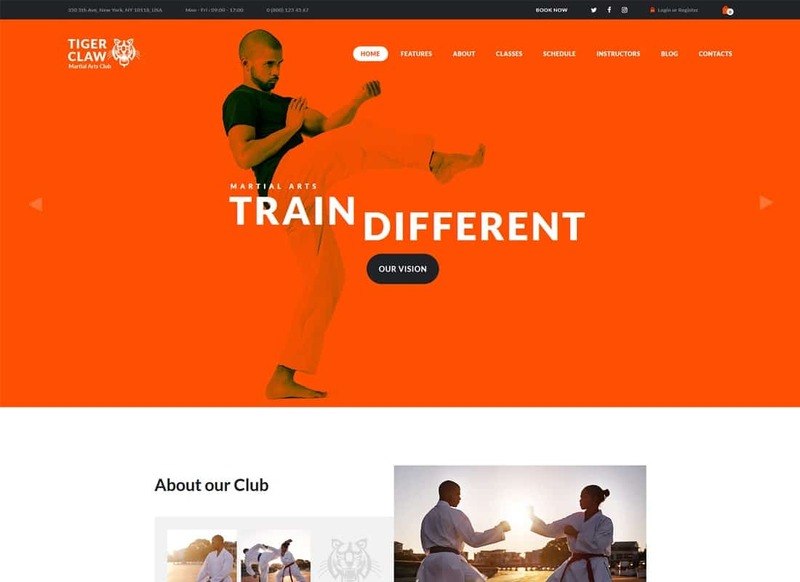 Riva is a modern specimen of sports and fitness WordPress themes that has an edge over the others. 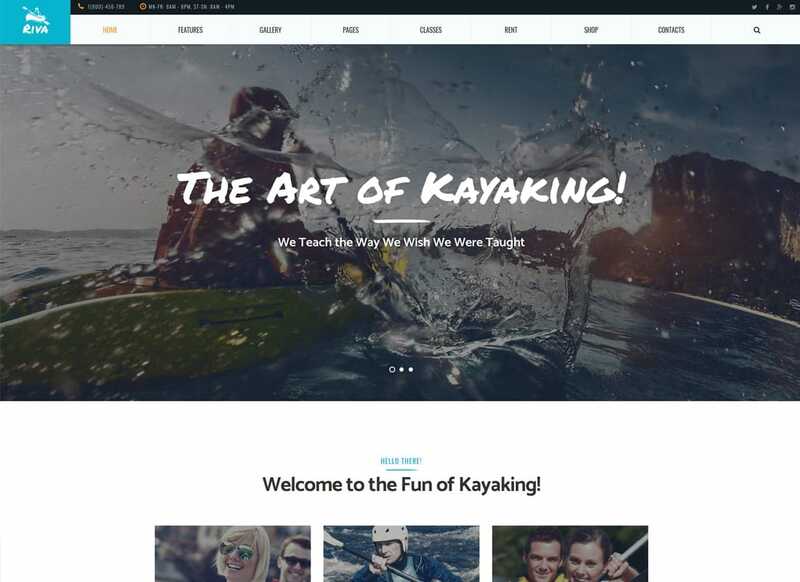 Clean, responsive and stylish, it fits yacht, kayaking, rafting, and boats rental services right off. So, it offers you a set of pre-made pages to help get you started quicker. Apart from that, you get a huge number of custom shortcodes & modules to skip a lot of the time-consuming work. The more people you get in the door, the more successful you can be at turning leads into memberships. The most important thing to keep in mind when building your website is who your audience is. As long as you keep the focus on your target audience, it's easier to get more incurious site visitors. Modern, bright and stylish, Skateboarding can help you become the next one in your niche. It's second to none for sports clubs, graffiti & skateboarding websites. Besides, tons of eCommerce options give you an opportunity to make it big in sales & grow your business. Try your hand at creating stunning galleries that catch the attention. Promote your best-selling products or services through eye-catching sliders. Now, go and use Skateboarding to your full advantage. Are you a fan of American football? Maybe you have a team that plays the top league? First of all, you need a website that will make your hobby a success. 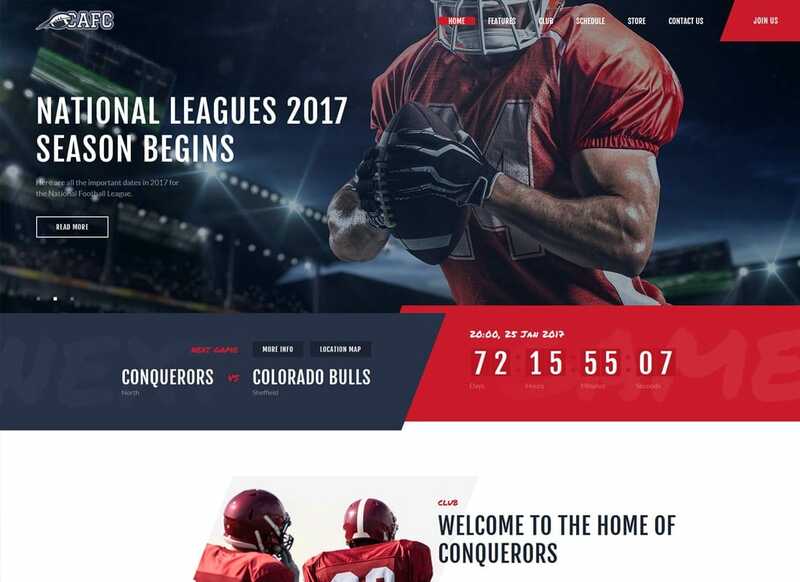 Conquerors is a modern WP template designed to match the needs of sports team websites. Thus, it comes with 3 homepage styles that fit well into your sports niche. Apart from that, it comes with WooCommerce integration, so you can start selling clothes and equipment in mere minutes. In case you need more beautiful layouts, feel the freedom to create as many as you need with WPBakery page builder. At the end of the day, you'll get a website that never misses the aim. Don't miss out on the opportunity to build a modern sports website like a pro. Designed for hockey school & sports websites, Let's Play comes with 5 beautiful homepage styles that fit different sports niches. So, you save time right from day one. 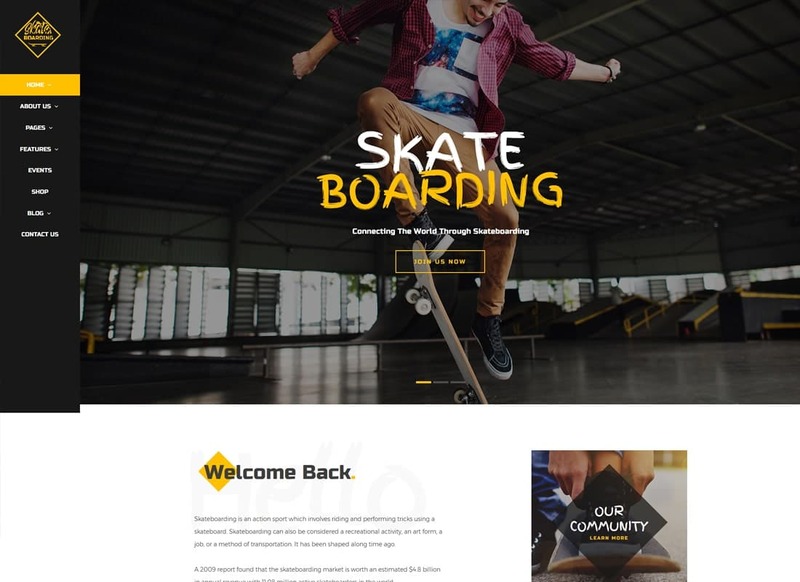 Being one of the most versatile sports and fitness WordPress themes out there, it gives you the freedom to get creative with it. Besides, you can add an online store functionality and start selling in a matter of minutes. Want to be a cut above the rest? No problem, create as many unique layouts as you need to tell your story in a more appealing way. With millions of sports clubs out there, how do you show people that yours is worthy of their attention? With the right WP template, you can stand out among even your toughest competitors. 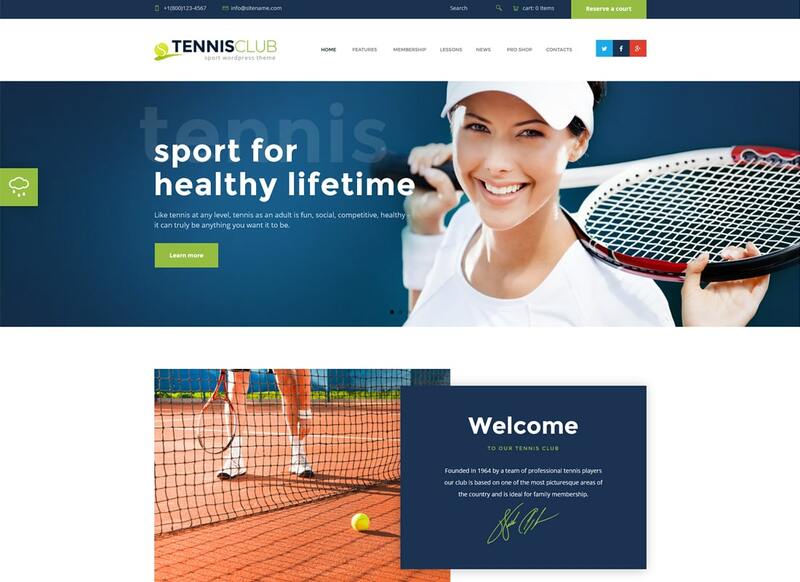 Stylish, fresh and attractive, Tennis Club is one of the best sports and fitness WordPress themes on the list. It's a perfect solution for tennis classes, sports centers, and sports review magazines. Built with WPBakery page builder, it allows you to get creative with it. Moreover, it puts the power into your hands to create unique layouts with less coding issues. Besides, you can start selling your products, add upcoming events, matches, and games, create stunning galleries, and much more. Promote your sports club to the people already out there looking to become a member. If you don’t have one yet, create a professional website for your business. Promoting your sports club is not just about pulling in new members but also making your current members happy. 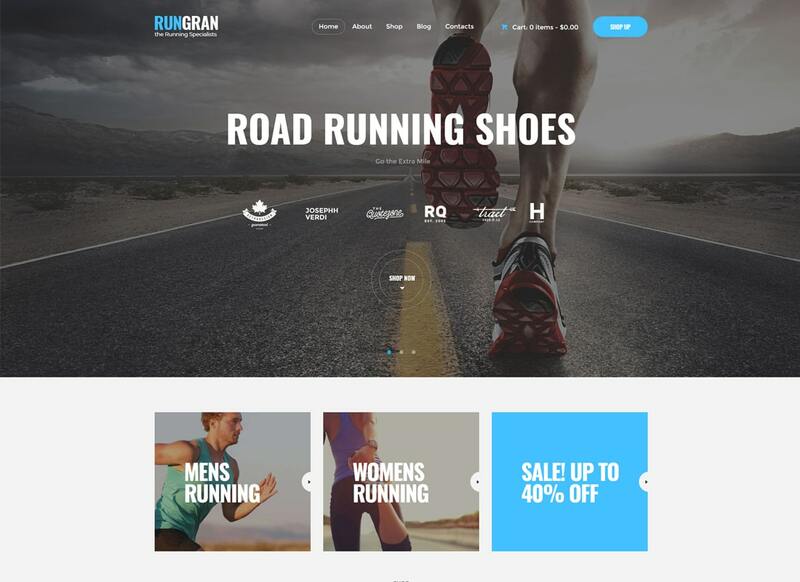 If you're still confused with the concept of your website design, give RunCrew a try. Stylish, modern and responsive, it sticks from the best sports and fitness WordPress themes on the list. Start a blog so more people have exposure to your brand and are excited to learn more about your gym. WooCommerce ready, SEO optimized, and flexible, what else could you ask for? So, how does it fit in with your plans? 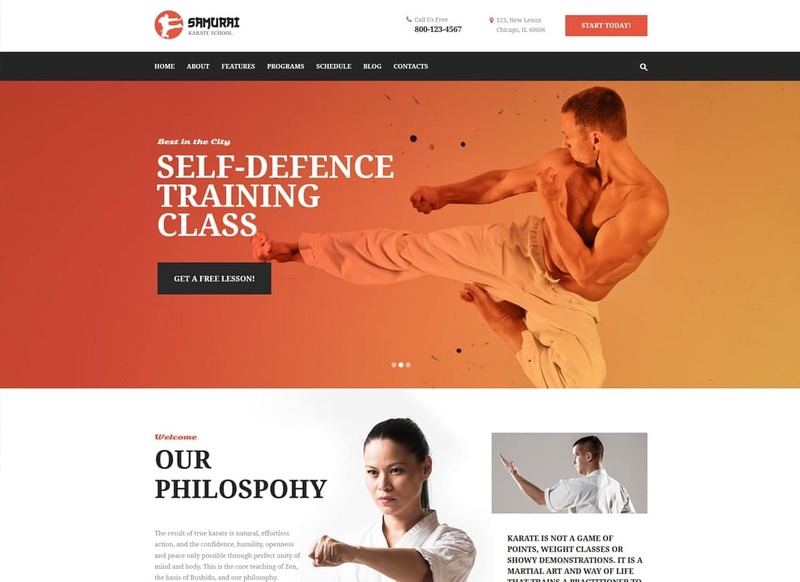 Samurai is a fresh and powerful WP template designed for karate & martial art websites. Of course, the ability to create extra layouts saves you a ton of the time-consuming work. Moreover, it allows you to build any other website related to the sports industry. Maximize your online potential and profits without any prior coding experience. Fear not, tons of eCommerce options will come to your aid. So, don’t make your brain hurt. Instead, use the robust functionality of Samurai to your advantage. Promote your best-selling products through stunning galleries. While the eye-catching sliders will showcase your bells & whistles. Go, motivate people to come and see what your club is like. Golf Club is worth the attention for sure. Being one of the best sports and fitness WordPress themes on the list, it can help the ideas roll. Take the next step in expanding your sports business with Golf Club. Apart from a set of pre-designed homepage styles, it comes with tons of pre-made pages that allow you to skip a lot of the time-consuming work. What's more, it includes an advanced field picker, field schematics & reservation. Indeed, it allows you to make it big on sales by selling just about anything online. But don’t try to sell, rather provide value, help your members and non-members reach their goals and you’ll see a different response. A professional website is a fairly inexpensive, yet very effective way to advertise your sports club. 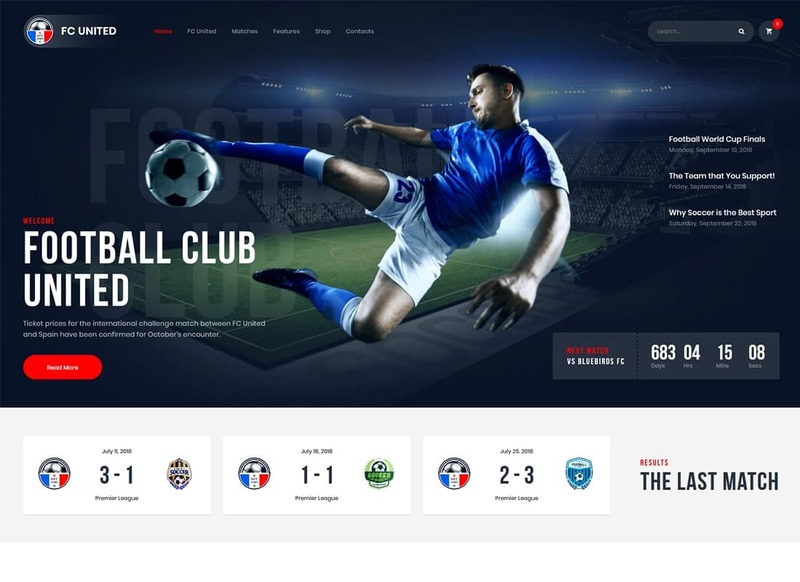 Designed for soccer & football club websites, Soccer has you a lot to offer. Indeed, it comes with awesome league tables, match report, and team & player profiles with stats. Besides, it's WooCommerce ready, so you can start selling your products straight away. Get more people to sign up with your e-mail list by using a pop-up on your website. 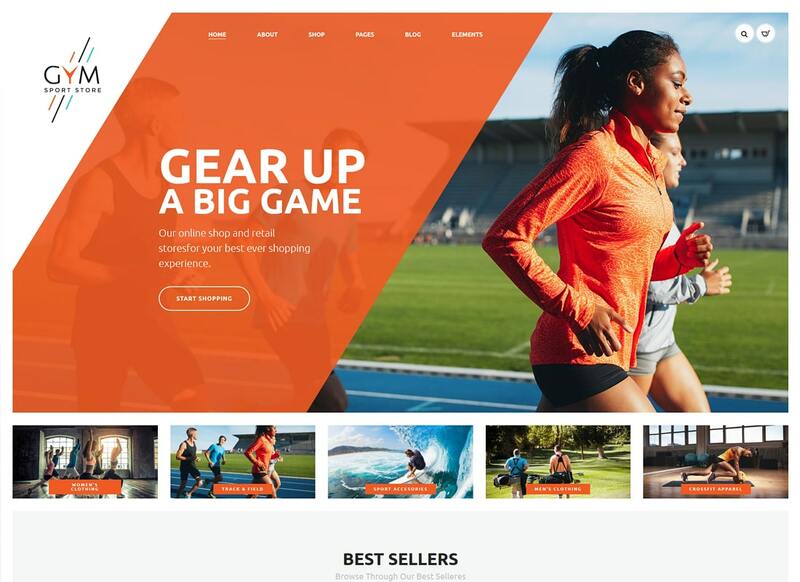 All in all, being one of the most alluring sports and fitness WordPress themes on the list, Soccer can help you launch fast. Do you want your website to be better? No way, your website should be different, not better. As long as your website offers a unique value proposition, it’ll be easier to stand out from the crowd. Confused about the right specimen of sports and fitness WordPress themes? Give Rock & Wall Climbing a check. So, apart from promoting your sports club, you can also launch a fully-functional online store that makes it big in sales. Indeed, you can always create new unique layouts that can help strengthen your business benefits. Also, it comes with lessons & courses arrangement, events management, and a set of advanced contact forms. Entice people to see more of your classes, rather than showing them everything. Get completely tuned up with N7. 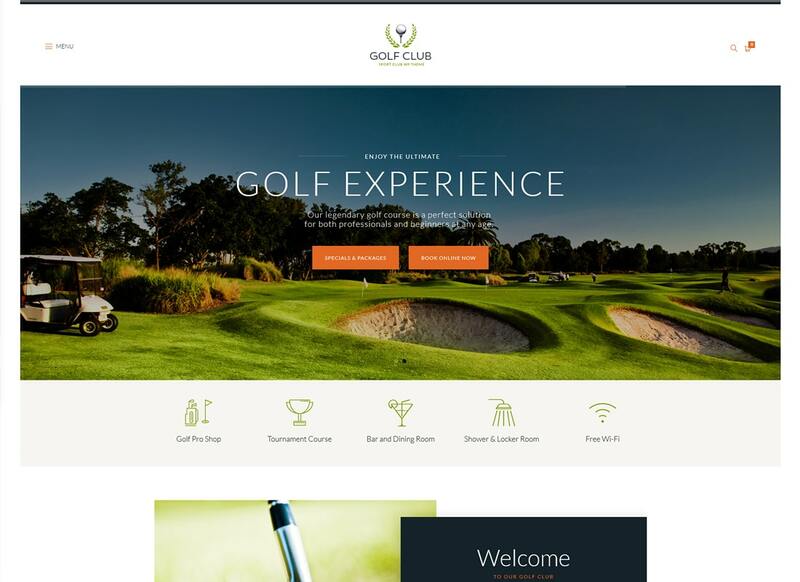 Modern, attractive and clean, it fits golf club web projects right off. Indeed, being very flexible and versatile, it can be customized for any other type of website related to the sports industry. Owing to WooCommerce readiness, it allows you to launch an online store without having to sweat for it. Start making profits straight away just because no prior coding experience is needed. Of course, it's responsive from the ground up and looks consistent no matter what type of device the user is on. Now, invite your users to come and see for themselves what you offer. Blow your competitors out of the water with an outstanding website that sticks out a mile. 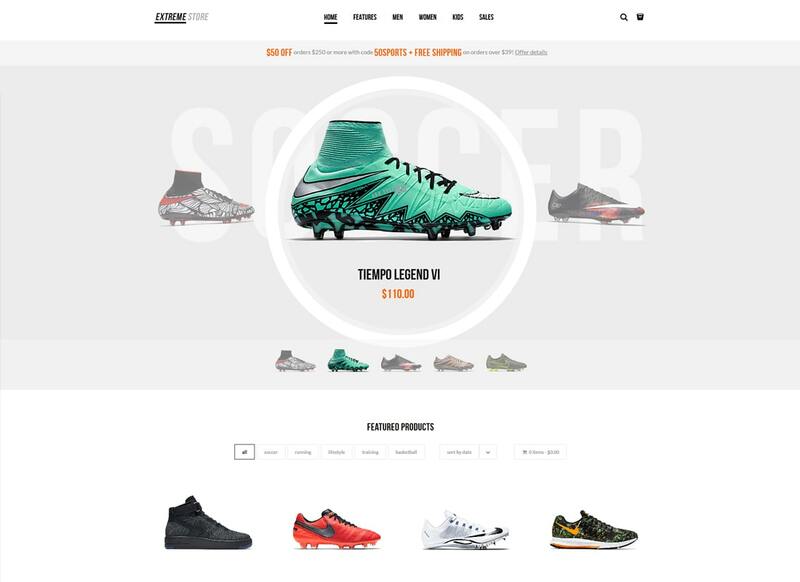 Tease your users with a modern sports website that shows them some real interest. Fresh, stylish and clean, Yogastudio follows the rules of simplicity. Enjoy its intriguing layout, tons of advanced features & robust functionality. It fits yoga school, retreat center, wellness & spa salon, as well as beauty websites. Poke around the theme settings, you’ll be surprised with everything that they offer you. Don't shy away from launching an online store just because of a skill gap. There’s nothing to stop you. Welldone can help make your website personal and create a relationship. Designed for all kinds of modern sports websites, it can help automate many tedious site-building tasks. Compatibility with WBakery page builder is one of its perks that make Welldone worth the trouble. Of course, you can launch an online store even without having to sweat for it. Engage with users on social media to encourage membership loyalty and word-of-mouth advertising. Enjoy 9 beautiful homepage layouts galore to draw your users in for a good reason. Now, take time to explore the power of Welldone right away. 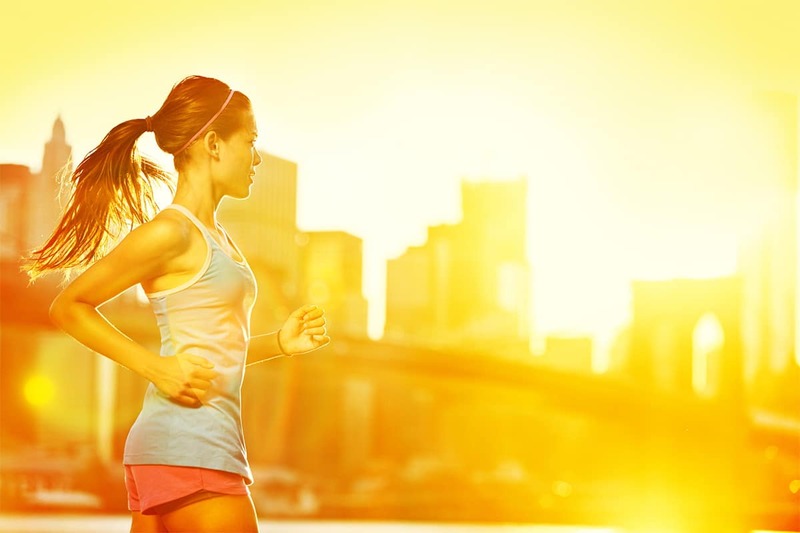 At the end of the day, you can change the game of health marketing in the sports industry. Raider Spirit can give you all the tools and support you need to make the dreams for your business happen. 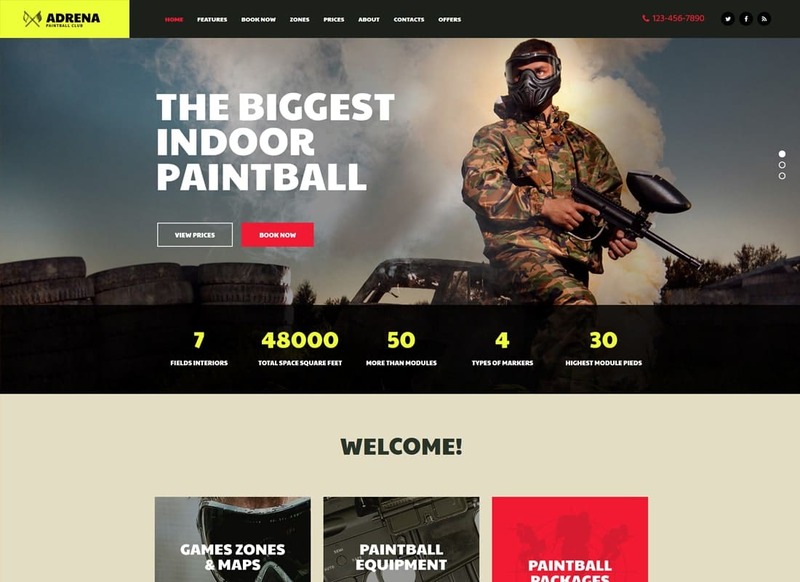 Stylish, modern and eye-catching, it fits paintball club websites right off. The theme is versatile enough to customize it up to your particular business needs. Apart from that, you can add more creative layouts to tell the story behind your sports club. You'll be able to add an online store functionality to make sure your business can continue to run smoothly & successfully. Don't shy away from starting a blog. It may not have any content specific to your sports club, yet it still can pull in your targeted audience through helpful tutorials, videos, and content.